There are many factors that can contribute to the successful operation of a car wash, including location, customer service, pricing, and reliable equipment that doesn’t break down. A car wash that is often closed due to mechanical problems is not going to stay in business for long. as part of routine maintenance. Many of these factors should be addressed in the “design-build” stage, according to Thomas Ennis, president of Inglewood, CA-based NS Wash Systems. “Upfront planning is where many important decisions are made that can impact the overall success of the car wash and reduce costly repairs and maintenance expenses over time. “For example, in colder climates, we see all too often that important systems are left outdoors, where they can freeze or get covered in snow. Much better to build your car wash where motors can be placed indoors or covered; they need to be well ventilated and protected,” Ennis explains. California says, “Motors burn out when they are running during hot days and the placement of glass or windows next to equipment also is important. “Hoses next to glass that get the full glare of the sun creates a ‘green house’ effect and can ruin hoses quickly. Motors also need to be protected from the elements,” Gonzalez notes. Proper preventative maintenance requires car wash equipment to be greased, cleaned, dumped, and inspected on a regular basis. 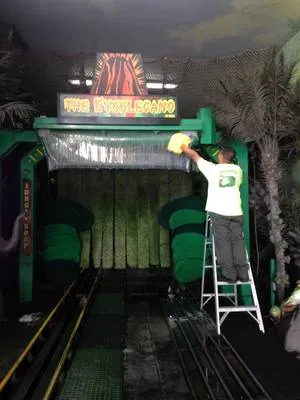 At the Green Forest Car Wash, employees are responsible for checking systems daily, weekly, monthly, and semi-annually. is part of William Morse’s daily routine. Alex Chavez, director of research and development for NS Wash Systems, agrees, but also recommends that employees should walk along with cars throughout the day, to check that all systems are working. Equally important in a preventative maintenance regimen is to involve car wash employees in routine system tests and checks. The more they know how the car wash and its systems are supposed to operate, the better they are aware if something is not operating properly and can react accordingly. Gonzalez recommends that employees shadow factory technicians when installing and servicing systems to become better acquainted with how the machines work. The end-of-the-day closing routine requires employees to shut everything down, relieve pressure on systems by turning off valves, and get rid of excess moisture in pumps. Giving everything a final look over before going home can save valuable time the next day. Green Forest trains its employees to perform routine maintenance and minor repairs. Employees can clean and change filters, clear or replace clogged nozzles, and replace broken or worn brushes or cloths. 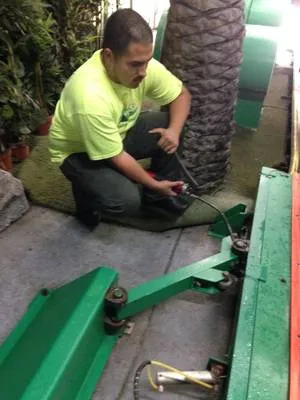 According to Green Forest’s director of maintenance operations, Oz Ibarra, it’s fixing the little things on a regular basis that saves major headaches and costly repairs in the long run. It’s a good idea to have lots of spare parts on hand, says Ibarra, and check the supply to keep stocked up. 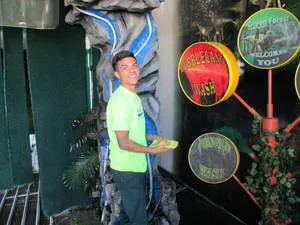 Ibarra makes sure that each Green Forest Car Wash has replacement hoses (both 1” and 2”), vacuum hoses, a spare sump pump, filters, and extra Lammscloth and brushes. The more employees know the car wash operations inside and out, the more they are familiar with what systems and parts will wear out and when. Ibarra says they always call a technician for machines that are under warranty or electrical systems, pumps, and solenoid valves. Knowing when to call for help from a licensed or trained technician is every bit as important as performing routine maintenance yourself. Keeping everything running and the car wash open is the number one priority. Ibarra greases the bearings on the tire shiner. Lack of preventative maintenance is one of the biggest reasons for costly repairs, Chavez says. “Employees should be involved in daily, weekly, and monthly routine maintenance, including cleaning filters, draining air compressors, and replacing nozzles. It’s the small things that will turn into big ticket expenses if not addressed during routine maintenance checks,” he adds. Chavez also notes that investing in a simple system will save on repair bills. “Our systems, for example, are not very complicated. If you can change the oil in your car, you can work on one of our systems.” When there is a problem, Chavez recommends calling a local technician, an electrician, or a plumber, for example, who was probably involved in the installation. 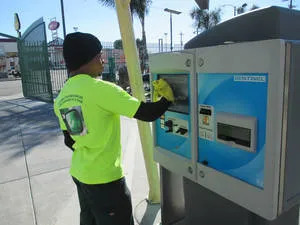 Collecting payment for the car wash, whether by an attendant or by the newer, more popular pay stations, is the most important factor in a successful car wash. Whether the polite smile of the attendant, or the simple ease of swipe-and-go technology, the pay station is your car wash’s first impression to the customer. cleans the pay station, keeping it dust free and working. Dual access doors, one for service and maintenance procedures and the other for operator and manager access, make the pay station convenient to check, fix, and maintain. To minimize downtime, ensure that technical support is available seven days a week and that the supplier has a distributor network throughout the country to service express car wash payment systems. 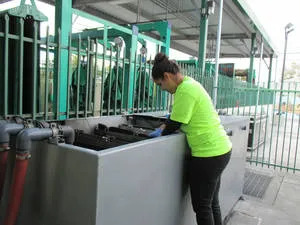 Bottom line is tunnel car washes today have equipment and mechanical systems that need the human touch to stay operational. Pay attention to preventative maintenance and employ helpful attendants that understand customer service and you are well on your way to operating a successful car wash.